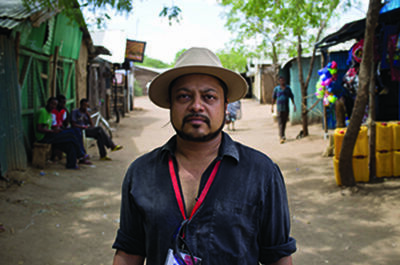 In June 2014, Raouf Mazou, the representative in Kenya for the Office of the United Nations High Commissioner for Refugees invited economic anthropologist Rahul Oka — Ford Family Assistant Professor of Anthropology and fellow in the Kellogg Institute — to speak at a workshop on refugee issues that fall. “Representatives were there from the World Bank, UNDP (United Nations Development Program), UNICEF (United Nations Children’s Fund). All the acronyms were there,” Oka said. Oka for years has studied humanitarian and development efforts in Kenya’s Kakuma Refugee Camp, now more than 20 years old and housing nearly 200,000 displaced people fleeing war and violence in their homelands. On his first trip to Africa in 2000, Oka was there to study the archaeology of ancient trade on the east coast of Africa and the west coast of India — where trade has taken place for more than 3,000 years. In 2007, he started to look at trade conducted in conflict zones, from Kitale in Western Kenya to Juba, South Sudan. We have a mental image of refugee camps — clawed, hungry hands reaching for food. Kakuma is situated in Kenya’s harsh and inhospitable far northwest in Turkana County, formerly Rift Valley Province. The area is largely populated by the indigenous Turkana people, one of the most isolated ethnic groups in Kenya. The Turkana are a semi-nomadic pastoralist tribe depending for subsistence on raising livestock — camels, cattle, sheep and goats. 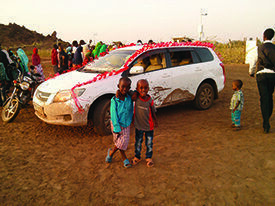 Even the most carefully planned humanitarian and development efforts are often stymied by the chaotic realities on the ground in war-torn zones such as Sudan and Somalia. Oka aims to improve the success rate of these critical relief missions by studying how local trade networks are able to operate in the same areas with remarkable resilience and efficiency. Food aid, he notes, creates its own cottage industry. Food is brought in from the European Union or the U.S., but the NGOs (nongovernmental organizations) distribute it. Food aid is then sold on the black market and becomes part of the camp’s multimillion-dollar informal economy. “How do traders manage to get their items across different militia and warlord territories when nongovernmental organizations can’t — or can only do it expensively and inefficiently through armed truck convoys or by air-dropping food and other relief supplies?” he asks. Food sold on the black market goes to camp stores and into the community, and refugees have the money needed to purchase other necessities. A list of the commodities traders bring in includes such staples as tea, coffee, sugar, fresh milk, tuna, spaghetti, yogurt, toffee, juices, water, detergent and shampoo, sanitary napkins and cigarettes. As an anthropologist, Oka is able to talk to the refugees directly. He’s able to tap into the gossip network in the camps, the suffering of the people, the complaints about relief workers. To explain what refugees need, Oka said, there are two key words in Swahili: heshima, or dignity, and matharau, the opposite of dignity — humiliation and neglect. Matharau is what leads to conflicts and violence. A photo taken at the wedding of a friend—typically the bridal party journeys to a scenic area to take photos. The children are relatives of the wedding couple. The car is muddy from negotiating potholes and mud ditches on the camp roads. One thing Oka was able to bring to the attention of aid organizations was an understanding of the inappropriateness of some of the food donations. In another instance, there were riots last year because two South Sudanese groups were put in the same compounds — Dinka and Nuer — each fleeing recent slaughter by the other.